This configuration is a guide to setup Endicia, part of the Stamps.com family. The following setup procedure is for Endicia® and Acctivate Inventory Management Software. If you have not purchased the Shipping Workstation module please contact your sales person. The setup typically can be completed in less than one hour. 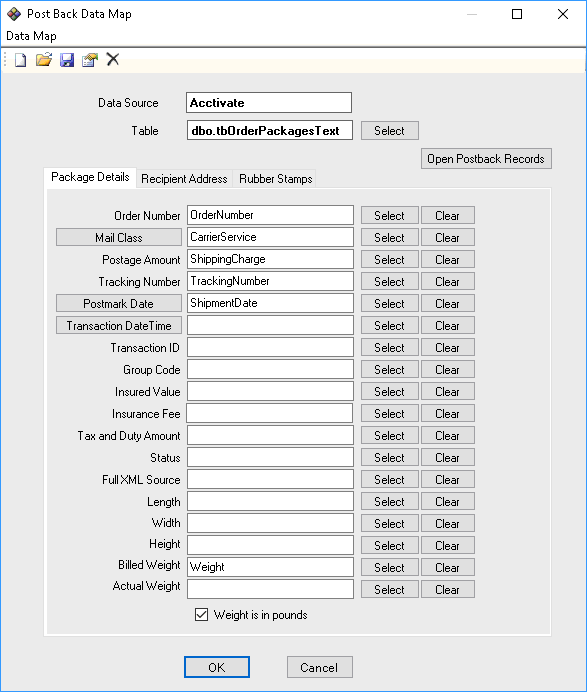 Configuring Endicia® to Import data from Acctivate. Next, you must be logged into your shipping workstation, launch the Endicia® software. Acctivate and Endicia Shipping software can be integrated for use with USPS (United States Postal Service). An Endicia customer account is required and must be installed on the Shipping Workstation computer. If you are not an Endicia customer, first contact Endicia and create an online account. 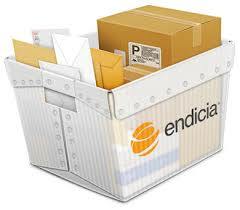 Once you have created an account with Endicia you must download and install the Endicia Shipping Software. 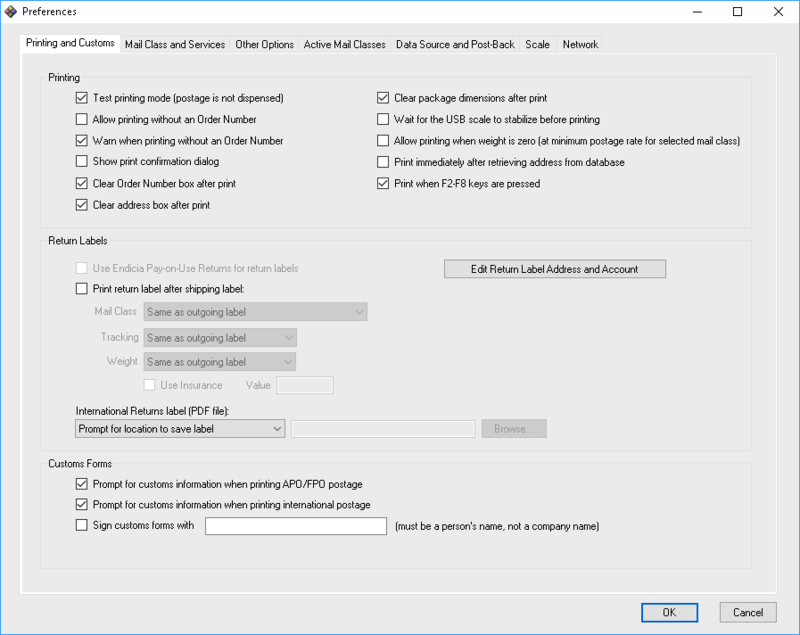 Next configure a 32bit ODBC connection. This connection will allow communication between Endicia and Acctivate. 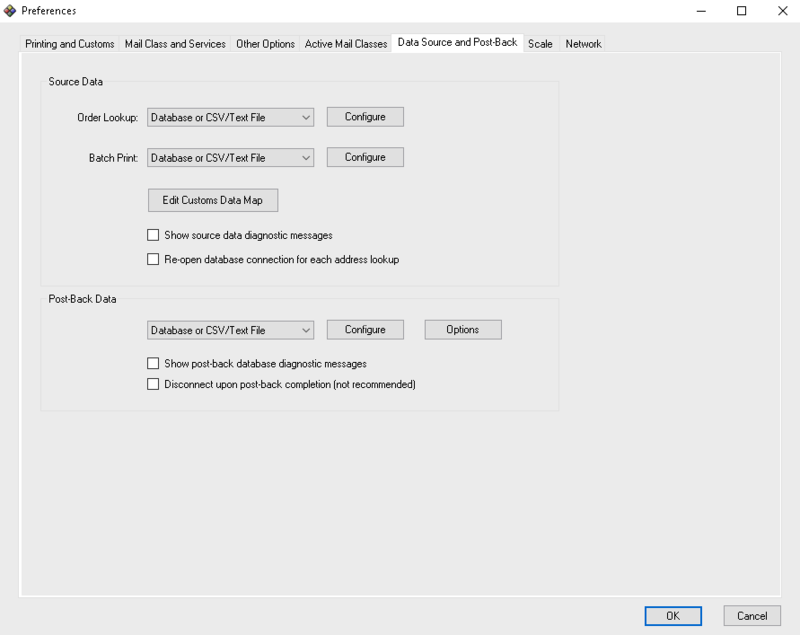 If you Can’t Find Created ODBC Connection you may have created a 64bit connection, both Acctivate and Endicia will require a 32bit connection. Click Configure for Order Lookup to open the configuration window. You may be prompted to enter the correct Login ID and Password to connect to SQL Server. Click OK. In this window you will map fields from Acctivate into Endicia. This allows Endicia to have access to your orders that are ready to ship. Select the ODBC Tables drop-down menu, located on the top left side of the screen, and select the OrdersAvailableToShip table. 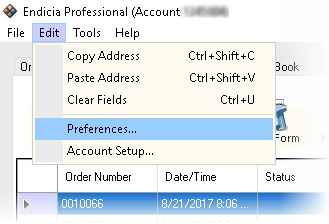 Make certain that the Endicia Fields drop-down menu (the right column) is set to Shipment Information. 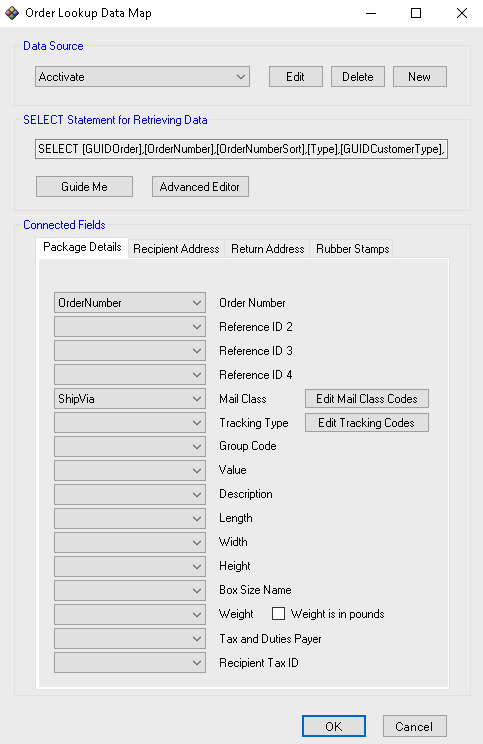 Click on the Column Name column twice in the OrdersAvailableToShip table to arrange the column names in alphabetical order. Complete the mapping assignments in the following section. 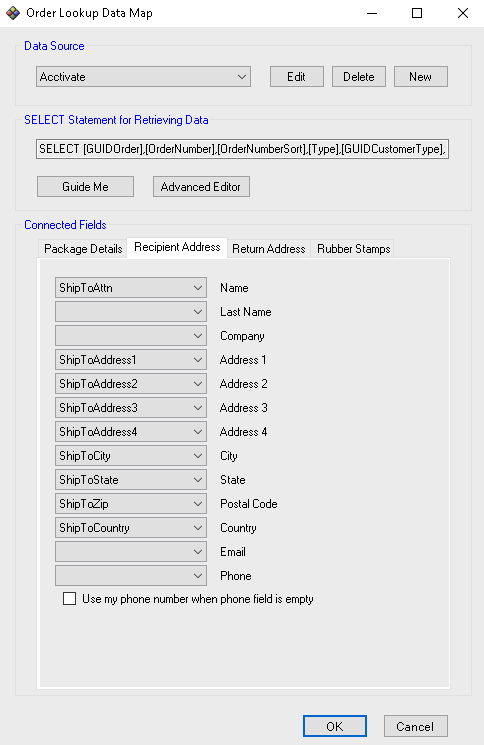 At this point, you are ready to begin mapping ODBC tables to Endicia Fields, using the mapping list on the following page. This is the most crucial stage of the configuration process. It is critical that you have the correct ODBC table name and Endicia Field selected when you click the connect button. The matching ODBC table name and Endicia field are a mapping set. 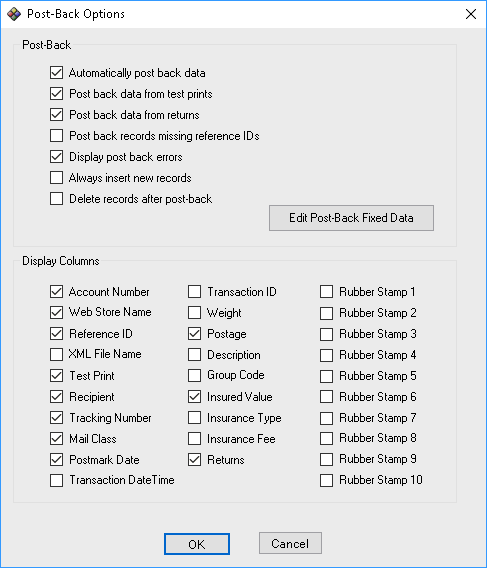 Single-click on the corresponding Endicia field (right column). Click the dropdown to make your selection. This will map the two fields together. Click Configure to open the configuration window. From the Preferences Window select the Post-Back Options. 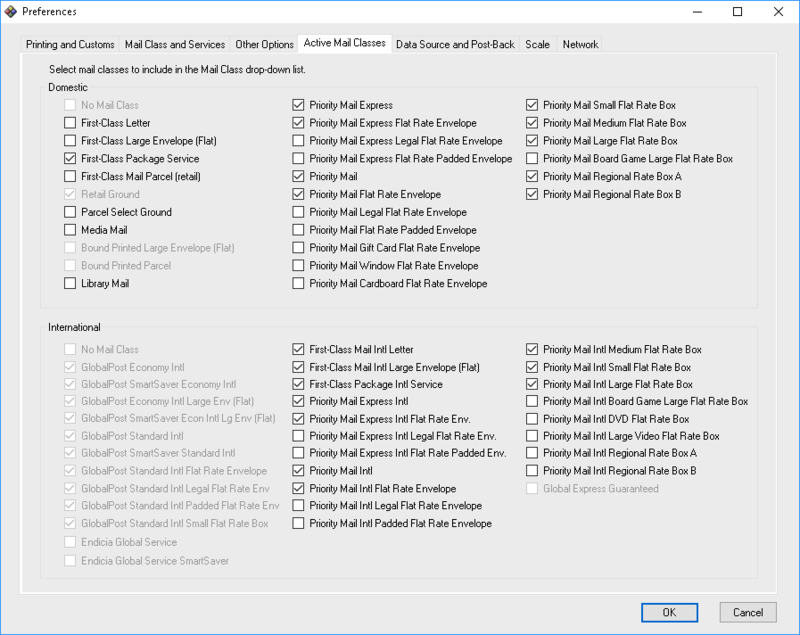 Select the Appropriate Mail Classes for you. Select Appropriate options for Printing.